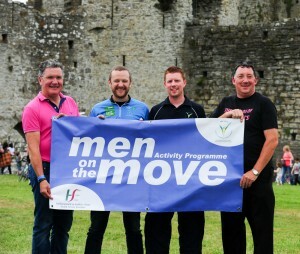 At the launch of the Men on the Move project at Trim Castle were (L to R): Philip Cassidy (Irish Cycling Legend), P.J Gallagher (Comedian), Ruairi Murphy (Meath LSP) and John Tobin (Friends of St. Josephs, Trim). Meath Local Sports Partnership in association with the HSE is launching an exciting new project Men on the Move in Meath this August 2014. Men on the Move is aimed at men in Meath aged 30 and over to get them active, have fun and improve fitness levels. Men on the Move will offer men a variety of activities throughout this new project. It involves weekly activity sessions which are tutor lead. You don’t need to be fit to take part- the training sessions are structured so that you can find the level appropriate for you to join and progress your fitness at a pace to suit you. The Men on the Move project will commence with an information evening on Wednesday 27th August at 8.30pm in Kiltale GAA. The information evening will outline what the Men on the Move activity programme involves and also includes a FREE health check for men so call into the above venue for your health check or just a chat about your health. General Overall Hurling-Specific Club Story goes here.